The region of Barile is home to a number of vineyards in Basilicata. Born and raised there, Elena Fucci, a young, vibrant and accomplished oenologist discovered her calling for her profession a few years after her grandfather who planted the first vine half a century ago, passed. Elena gave us a tour of the prized vineyards of Elena Fucci wines. Her wine is revived claims Elena, when combined with an ancient traditional pasta dish called i “tumaz matugl” a home made long ribbon-shaped noodle served with roasted bread crumbs. 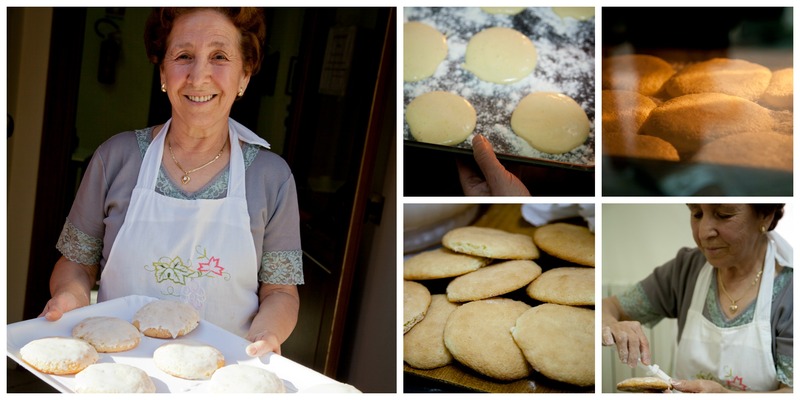 As the dough for the noodles is left to settle, Elena’s mom slices a section of the bundle to make “pizzi fritti” intertwined and fried dough bits, to be served with vincotto- the Elena Fucci version of cooked sweet wine. Fried dough and wine can provoke such a delightful burst to one’s palate. I certainly wasn’t prepared for this delicacy as I savoured two full pieces of “pizzi fritti” dipped in vincotto. The bitter sweetness of this heavenly syrup invited me to drink one too many glasses of the Fucci wines….needless to say I was a little tipsy by the time we got to taste the “tumaz matugl”. A plate of pasta more pizzi fritti, two full glasses of water and a double espresso almost succeeded in getting me back on track, but this time I needed an extra boost; that of a Phillip Morris Slimes cigarette. No, I don’t smoke- but desperate times call for desperate measures. I arrived to our next destination: Venosa, giddy and lightheaded…. But the elderly ladies from the Centro degli anziani, located in an old monastery of Venosa, a quaint town of Basilicata about 20 km from Barile, revived me. The community had heard that a Canadian production was interested in their baking talents. As my team and I approached the city-center we were greeted with journalists, elderly men playing cards and joyful women ready to showcase their sweet delights. I was treated to a basket full of “dolci della sposa” cookies baked on the bride’s weeding day, and chocolate “mostaccioli” generally served during Christmas festivities.